Your goals and what is important to you are the foundation of our planning process. We have built a process to help you identify and establish your goals, assess where you are today, and plan for wherever life leads you. 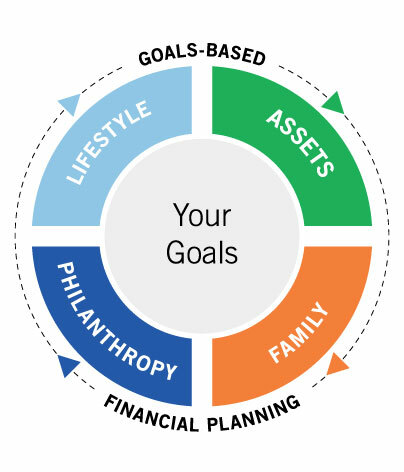 Whether your goals are to build, preserve, or transfer your wealth, we can help you get there. Our team is ready to work with you. We provide proactive and expert advice supported by a broad array of wealth management capabilities. We are here to help you achieve your financial goals and dreams. Your team will listen and work with you to identify your goals, expectations and concerns for you, your family, and your business. Next, we work with you to build a customized plan. We focus on your goals and what is important to you, but also address the unexpected and areas beyond your control. Your team will tailor a plan with solutions that will enable you to be confident about your financial future. With online tools you can monitor and even manage your progress towards your goals—anywhere, anytime. Above all, we partner with you. We not only focus on your goals and what is important to you, but we also plan for unforeseen events and situations beyond your control. We provide intuitive online tools that help you easily and securely manage your financial life. View all your financial accounts in one place, manage expenses, set a budget and save for personal goals. These tools also allow you to see the bigger picture, enabling you to view investments, calculate your net worth and make adjustments to your financial plan if necessary.